Matthew, born in Hampshire in 1976, first studied the organ with Robin Walker at St. Michael’s Parish Church in Aldershot, where he was also a chorister. After Sixth Form College he moved on to King Alfred’s University College in Winchester, receiving organ tuition from Christopher Monks at Winchester Cathedral. He was then appointed Organ Scholar at Peterborough Cathedral, spending time as both Acting Assistant and Acting Master of the Music. 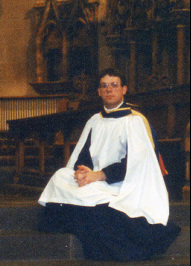 In 1998 he was appointed Organist and Master of the Choristers at The Cathedral Church of St. Paul in Dundee, at just 21 becoming the youngest Cathedral director of music in Britain. 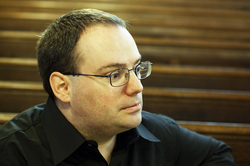 After a period of freelance work, including posts in St. Andrews and Dundee; Matthew was appointed Director of Music at Alloa West Church in March 2002 – where he spent just over six years. Since then he has undertaken performances throughout the UK and has appeared on many broadcasts and recordings. Matt is a perpetual student and has just completed his fourth degree with The Open University. In October 2016 he began studies for a Master of Arts degree. In summer 2013 Matt gained his LTCL diploma in Organ Performance with distinction, achieving an astonishing 90%. He is currently working towards further diploma exams. He was until recently Director of Music at the famous Thomas Coats Memorial Church - the "Baptist Cathedral of Europe" - in Paisley where he was custodian of the world-famous 4 manual 1894 Hill pipe organ - one of the finest in the world. Matt was recently appointed Organist and Music Coordinator at St. Michaels Parish Church in Linlithgow. Matt is a member of the Cathedral Organists Association and the Royal College of Organists. He is in high demand as a performer, arranger, conductor and teacher. In Autumn 2011 he celebrated 25 years in church music, from Chorister to Organist.